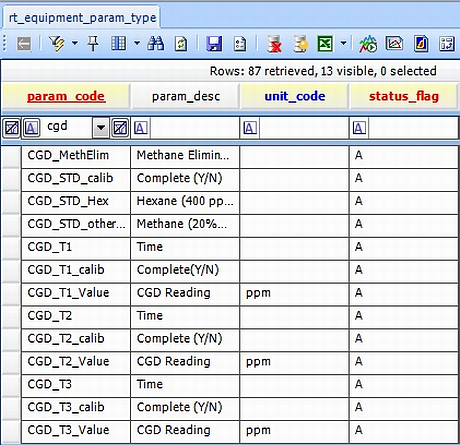 The Equipment Calibration Form in EDGE is intended to store all field calibration data. The form is built dynamically from tables in EQuIS. This option requires entering data into several EQuIS database tables in advance of creating the Reference Values (RVF) file (or re-creating a new RVF file) as explained in Create a Reference Values File. 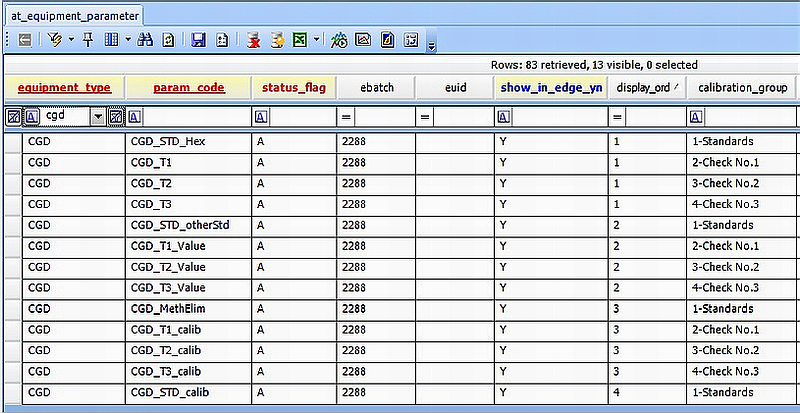 To simplify this process, use thre EDGE Configuration EDD Format with the example file available in Configuration Format to import the data into an EQuIS Database. 1.Use a copy of this example EDD to enter data. 2.The example EDD shows the kinds of data that can be entered in each column. Add, change or delete the data to get the values desired in the forms. 3.The format will map the data into each required table. Complete the following steps to build the Equipment Calibration Form. 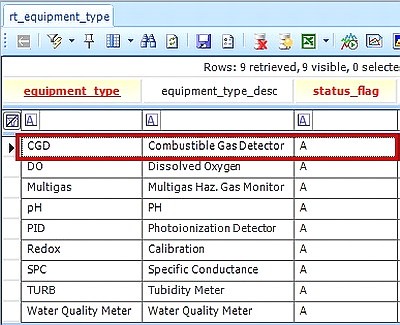 This example centers around a Combustible Gas Detector. 1.RT_EQUIPMENT_TYPE: Populate RT_EQUIPMENT_TYPE as demonstrated below. 2. RT_EQUIPMENT_PARAM_TYPE: Populate RT_EQUIPMENT_PARAM_TYPE as demonstrated below. Note: DISPLAY_ORDER defines the order of both the CALIBRATION_GROUP and PARAM_CODE in EDGE. The data from this form will be stored in DT_EQUIPMENT_PARAMETER except for the REMARK field, which will be stored in DT_EQUIPMENT_NOTE. Data and comments are related by EQUIPMENT_CODE and CALIBRATION_DATE. Calibration values now can be flagged if they are outside the acceptable ranges set in the action level tables. Follow the steps below to set up calibration action levels. 1.Open the EDGE_Configuration.xsd located in EDGE\Configuration Formats folder in EDP. 2.Create a blank EDD by clicking "Blank EDD" in EDP. 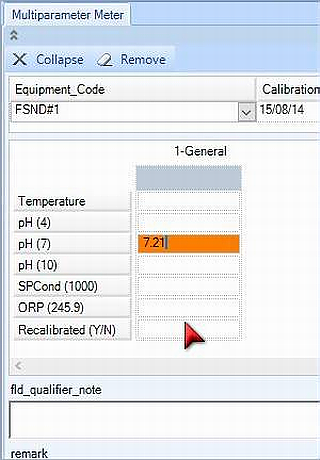 e.warning_level: Standard to check against in d. Example value should be +-0.2 of pH 7 Standard. Please note that some error colors and fonts can be changed, as explained in EDP Settings.